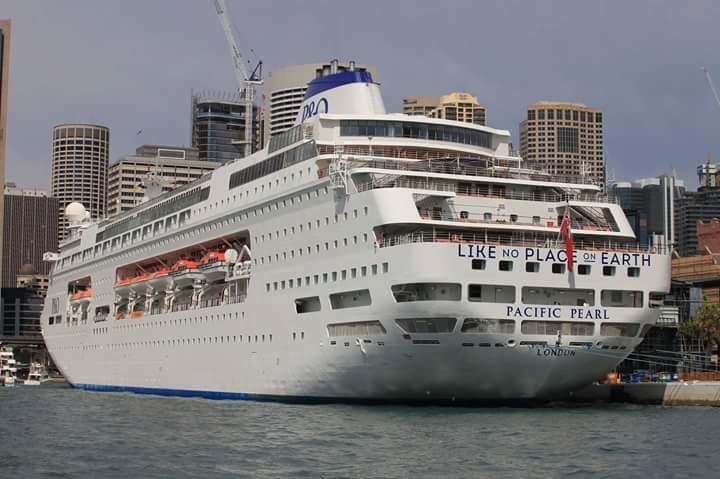 TODAY P&O CRUISES AUSTRALIA BIDS FAREWELL TO PACIFIC PEARL ! Today P&O Cruises Australia Bids Farewell To Pacific Pearl! Today we say farewell to the Pacific Pearl from the P&O Cruises Australia fleet, today she departs on her final 16-night Auckland to Singapore cruise. Pacific Pearl joined the P&O Cruises Australia fleet in December 2010 and was launched in New Zealand. 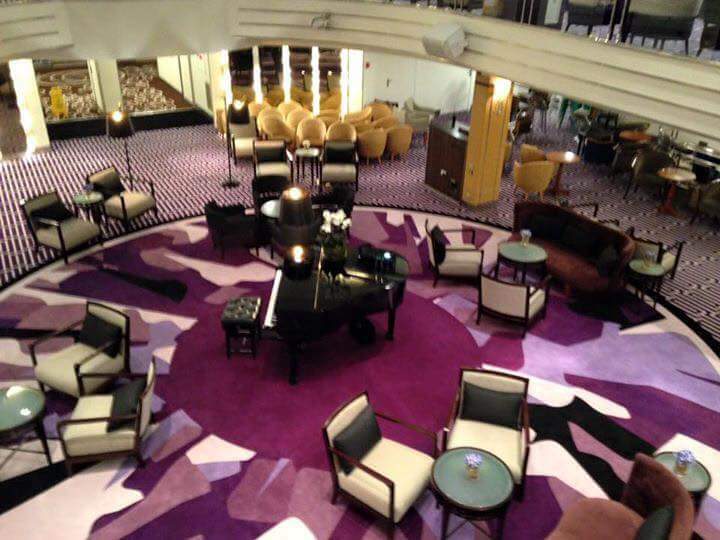 Her latest refurbishment happened in August 2015 and this brought her more into line with the two new refurbished ships Pacific Aria and Pacific Eden which have been refurbished to more contemporary upmarket look for the Australian cruise market. Pacific Pearls godmother is the New Zealand triple Olympic medal winner, Barbara Kendall. Pacific Pearl has completed 295 cruises while cruising for P&O Cruises Australia, she has also carried more than half a million passengers over a period of more than six years of service. “In becoming a much loved passenger favorite, Pacific Pearl made a huge contribution to building the cruise category in the region particularly in New Zealand, introducing thousands of holidaymakers to the joys of cruising,” said P&O Cruises Australia President Sture Myrmell. 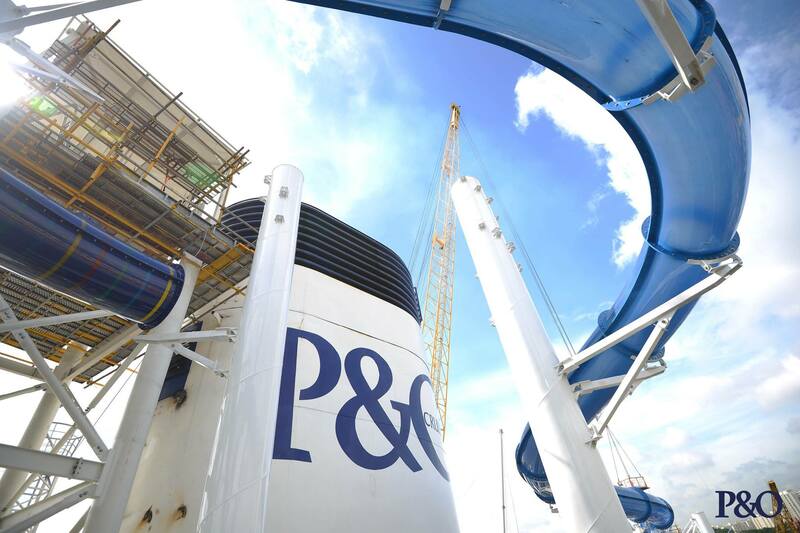 Mr Myrmell said Pacific Pearl’s departure was part of the ongoing evolution of the P&O Cruises’ brand. Pacific Pearl has certainly served the P&O Cruises fleet with class and elegance giving Australian and New Zealanders a touch of classic cruising ! Having you cruised on Pacific Pearl?? If so what are your favorite memories while being on board?? Tell us your stories, leave your comments below. PACIFIC DAWNS FEATURES REALLY ARE #LikeNoPlaceOnEarth ! Pacific Dawn one of Australia’s much loved cruise ships returned back to Brisbane after a two week extensive refurbishment in Singapore, what was refurbished well Australian Cruising News .com.au can confirm that nearly all the public areas on board have been. A guest on board has also told Australian Cruising News.com.au that none of the cabin areas had been touched. 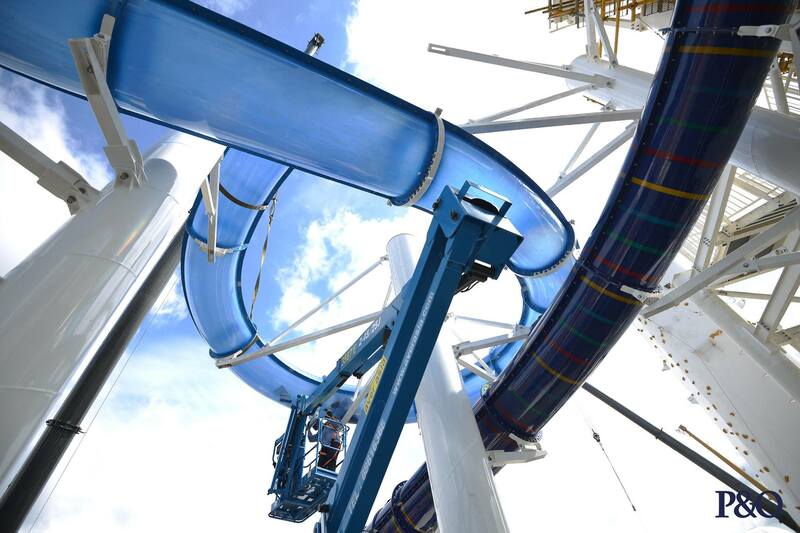 This means that the two new slides, both around 80 metres long, form the centrepiece of the extensive refurbishment. 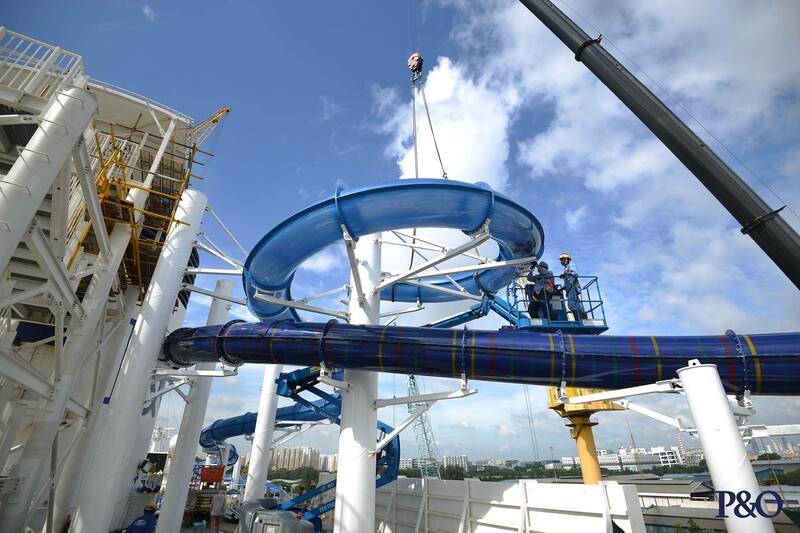 Pacific Dawn now has the wildest and longest waterslides on any Australian cruise ship! One slide is transparent so that spectators can watch guests shoot through its twists and turns, while the other slide is multi-coloured, with music pumping through it to give guests a high impact ride to the bottom. Other additions include a waterpark and P&O’s first virtual reality activity at sea from Sony Interactive Entertainment Australia. As part of the refurbishment, the 2000-guest Pacific Dawn has also become the first in the fleet to wear the cruise line’s striking new livery featuring the Southern Cross, a national symbol in both Australia and New Zealand. 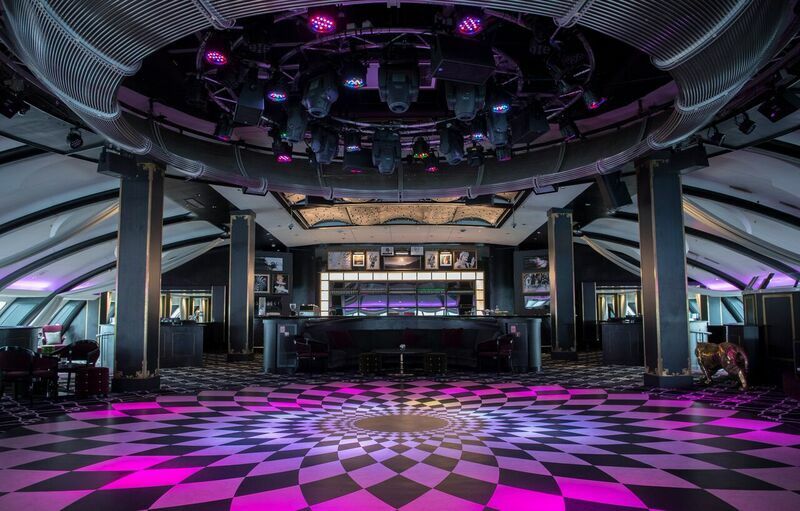 A team of 700 contractors spent more than 100,000 hours transforming the ship during its refurbishment with work including the installation of more than 18,000 square metres of carpet – almost enough to carpet all four exhibition halls at the Brisbane Convention and Exhibition Centre. Additions to the 70,000-tonne ship include more than 3000 pieces of new and reupholstered furniture, more than 1500 pieces of art and accessories and more than 500 new pieces of signage. 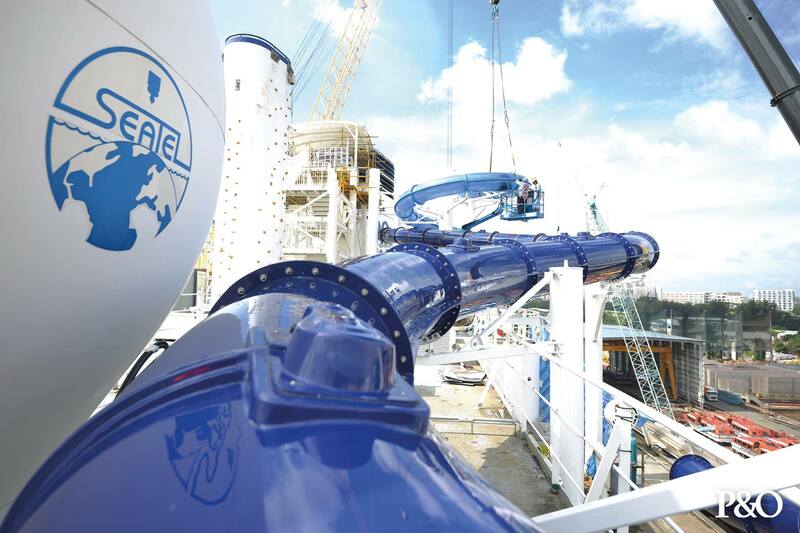 The two waterslides took almost 40 days to build offsite and on-board the ship, with final installation and testing occurring as Pacific Dawn returned to Australia. In the teenage clubs, HQ and HQ+, the entertainment has gone to a whole new level with the cruise line’s new virtual reality experience, featuring a range of popular Sony PS4 titles including Tearaway Unfolded, Gravity Rush 2 and Ratchet & Clank as part of the exclusive partnership with Sony. 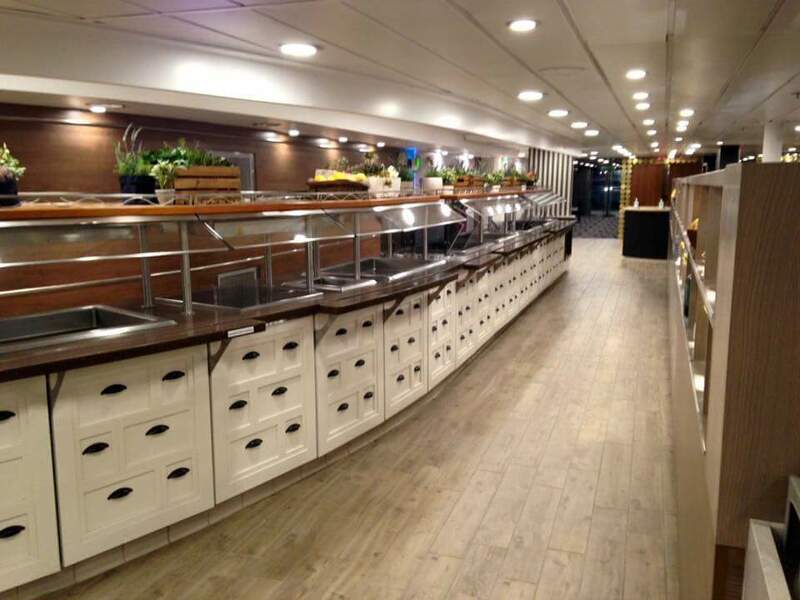 Pacific Dawn’s guests can now also enjoy a range of other new features on the ship including The Pantry, which was first introduced on board Pacific Jewel back in 2015. Pacific Dawn. The Pantry is an international market place of nine fresh food outlets which replaces the traditional ship buffet. Among its offerings are the Mediterranean-inspired Nic and Toni’s and seafood restaurant, Shell & Bones. 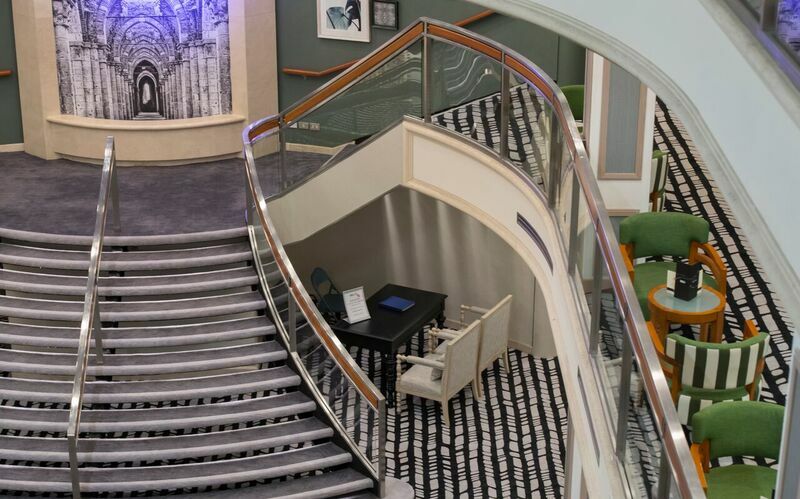 Many of the ship’s key public spaces – including the atrium, Charlie’s cafe, The Orient and the Promenade Bar – have been redesigned, they also have the contemporary Australia look which is one of the key features of both Pacific Aria and Pacific Eden. Its great see that P&O Cruises Australia have all of their ships in the fleet except one [Pacific Jewel} featuring the same look and features. Now they just need to bring Pacific Jewel into line with the rest of the P&O Cruises Australia fleet. 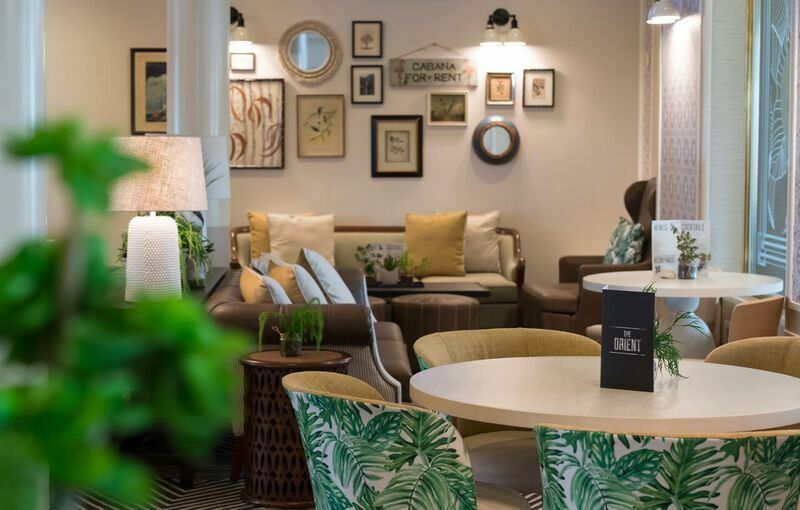 P&O President Sture Myrmell said the refurbished Pacific Dawn was the next step in the evolution of P&O’s modern Australian holiday offering, designed to deliver good times in a stylish yet relaxed setting. 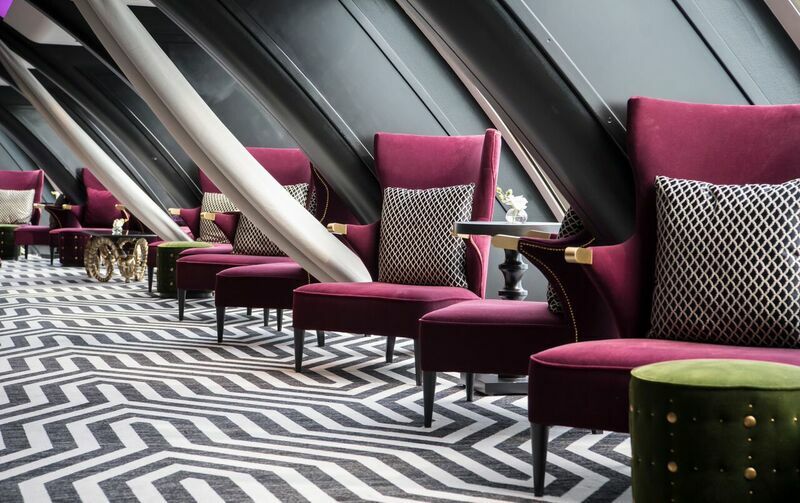 “Pacific Dawn not only features the new look and feel which has been so popular on our latest ships, Pacific Aria and Pacific Eden, she also provides a taste of what’s to come on our next ship Pacific Explorer, which debuts in June. We think she’ll be a real winner and we can’t wait to welcome guests on-board,” Mr Myrmell said. The refit comes at the start of P&O’s biggest year of Queensland cruising, with two ships sailing from Brisbane year round. Between them, Pacific Dawn and Pacific Aria will offer a record 108 cruises to holidaymakers this year, up from 98 cruises in 2016. According to the latest statistics, Queensland is the second biggest source market for Australian cruisers with more than 280,000 Queenslanders cruising in 2015, up almost 30 per cent on the previous year. During the 2015-16 financial year, cruising contributed an estimated $976 million to the State’s economy. Information supplied by: P&O Cruises Australia. www.australiancruisingnews.com.au The HOME Of Australian Cruising! AUSTRALIANS FINALLY GET ACCESS TO CARNIVALS FUN SHOP PROGRAM ! Australians Finally Get Access To Carnivals Fun Shops Program ! While there has been some excitement from Australian cruisers that Carnival Cruise Line, Australia has added the easy access tool of the ever so popular Fun Shop program, to its Australian website it’s about time I say and it should have been done a long time ago! Pretty much every cruise line that has ships cruising from Australia throughout the cruising season, Australians have access to their pre purchased gift program apart from P&O Cruises Australia who don’t have one! Why not! You’re meant to be Australia’s home-grown cruise line. It’s now taken an American cruise line that has only be homeporting in Australia since October 2012 to now provide this service that should be standard! Mind you Carnival Cruise Line, Australia its still a watered down version of what is avalible on your American webite, why is that ? Fun Shops lets guests – or their friends and family – pre-purchase gifts before their cruise departs, allowing them to surprise loved ones who are booked on Carnival Spirit and Carnival Legend cruises from Australia. Carnival Cruise Line Vice President Australia Jennifer Vandekreeke said with many guests booking a cruise to celebrate a milestone occasion, Fun Shops provided the perfect opportunity to make the experience even more memorable. “We all enjoy a surprise every now and then, and there is no better way to start a holiday than arriving at your cabin to find an unexpected bottle of bubbles or a beautiful bouquet,” Ms Vandekreeke said. Perfect for celebrating a birthday or anniversary, or just as a pick-me-up, the gifts include flowers, balloons and decorations, sparkling wine, cheese platters, fruit hampers, chocolate cake and chocolate-covered strawberries. Australians expect much more from cruise lines now we have been cruising long enough now to know what is acceptable and what is not! We want better ships with world class amenities, accommodation, entertainment and food. The majority of Australians don’t like having their gratuities included in their fares either, if we feel that its warranted to tip staff for great service, we are more likely to do it at the end of the cruise and give the appropriate person. We also expect more in the way of social media connectivity at sea, with better internet coverage and speeds at competitive prices. We want to be taken to amazing destinations for the cruising holiday of a lifetime, after all we have paid for it! 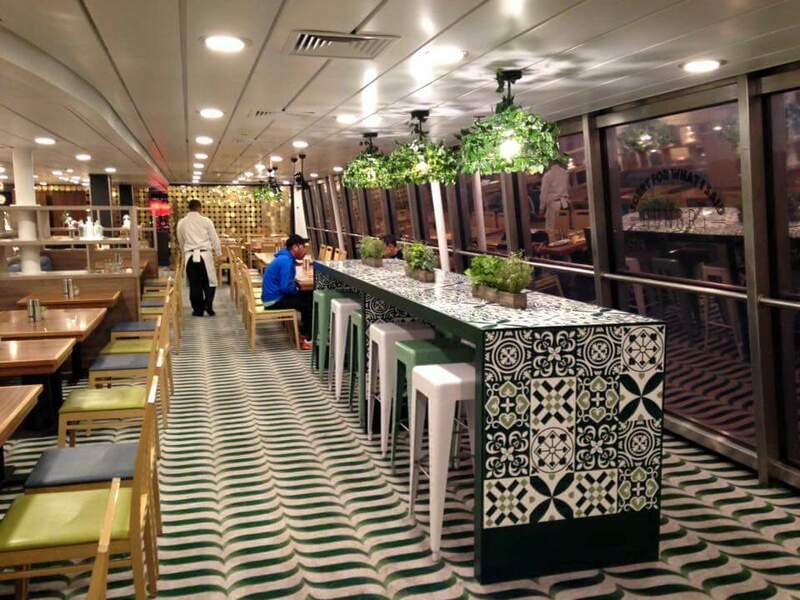 FLEETWIDE STATEROOM CATERGORISATION TO HAPPEN ON ALL ROYAL CARIBBEAN INTERNATIONAL SHIPS. 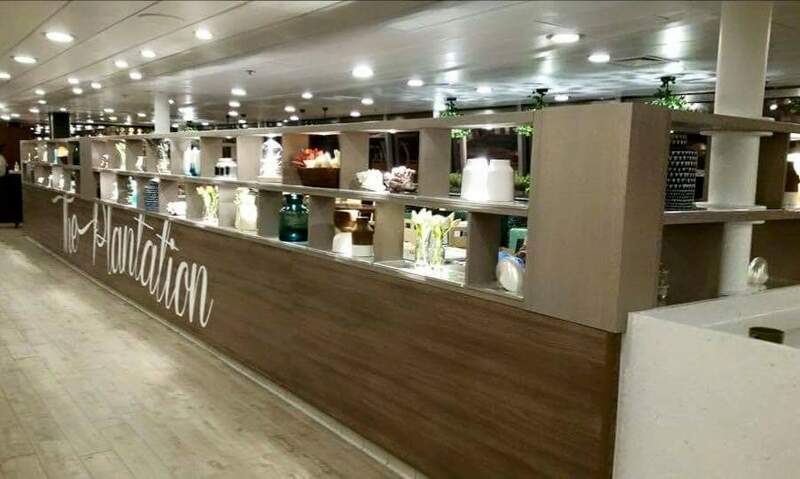 Fleetwide Stateroom Catergorisation To Happen On All Royal Caribbean Ships ! Royal Caribbean International have decided to make changes to the way they categorise their staterooms on board their ships, in a fleet wide first. Whether you’re a travel agent or just a future or returning guest of Royal Caribbean International reading the stateroom categories on a Royal Caribbean ship is set to get a whole lot easier! The new stateroom categorisations are going to be effective for all future deployments for sailings from April 2018 onwards, on all Royal Caribbean ships. So what’s going to happen?? 1. Royal Caribbean International are going to be changing the way they talk about staterooms, to simplify our naming conventions and make it easier for everyone, so that you can choose your stateroom with ease. Deck, size, occupancy and location - making it easier than ever for you to find your ideal Stateroom accommodation. Below is a Pdf file from Royal Caribbean International setting out on how this all should work out. Information supplied by: Royal Caribbean International. PACIFIC DAWNS DEPARTURE FROM SINGAPORE DELAYED DUE TO PROPULSION SYSTEM MAINTENANCE ISSUES. Pacific Dawn Departure Delayed From Singapore Due To Propulsion Maintenance Issues. According to a P&O Cruises Australia spokeperson, Pacific Dawn will be delayed from her Singapore departure a day later that expected due to a technical issue associated with Pacific Dawns referbishment that has taken longer than expected. The delayed departure will mean that the call into Dili will no longer take place, while the rest of the itinerary remains in place. 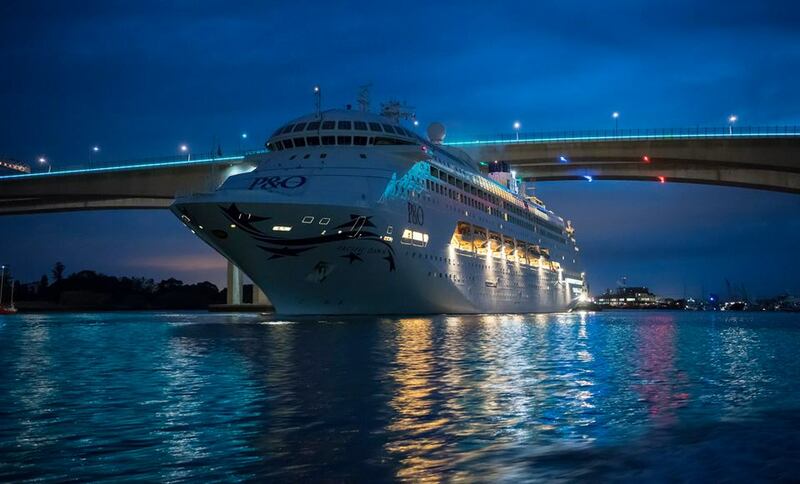 P&O Cruises Australia have also said that they will be doing everything possible to make guests comfortable in Singapore to minimise any incoveniance. While if this is the case, why did P&O Cruises Australia decide not to make Pacific Dawns dry dock longer so that any minor issues could be ironed out ! You would have thought P&O Cruises Australia would have learnt by the previous issues that they had with the the ex Holland America ships Ms Statendam know as [ Pacific Aria ] and Ms Ryndam known as [ Pacific Eden ]. These two ships have had many issues that were not ironed out, when they both came out of their extensive referbishments in November last year, causing many guests to complain. Australian Cruising News .com.au have since learnt via the P&O Cruises Australia facebook site that the following statement has been issued. Hi Everyone. Following our update yesterday, and as you look forward to your Indonesia Explorer cruise, we want to confirm that Pacific Dawn will depart from Singapore a day later than scheduled. 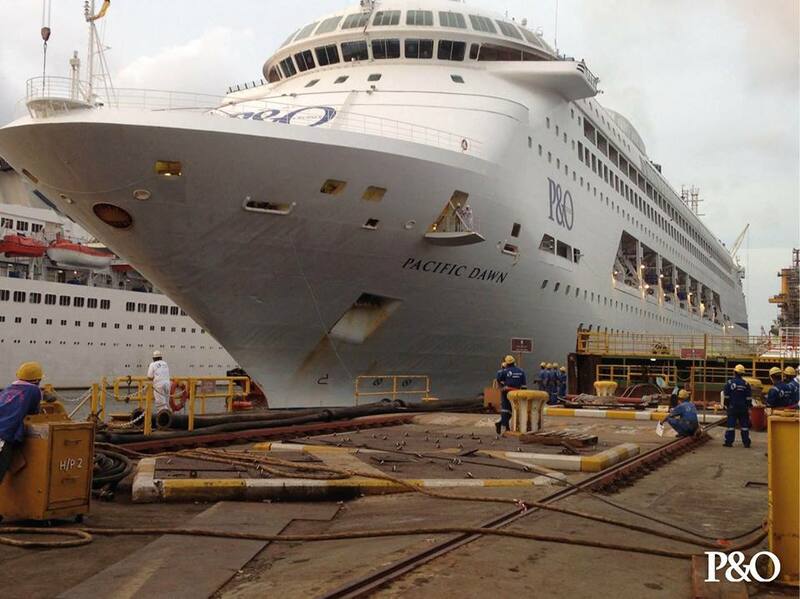 Pacific Dawn has been undergoing an exciting refurbishment during a scheduled dry dock in Singapore. In addition to the refurbishment, routine mechanical inspections have also been carried out, and some additional unexpected maintenance to the ship’s propulsion system has been necessary. This additional technical work has taken longer than expected, and as a result Pacific Dawn will leave dry dock later than planned. 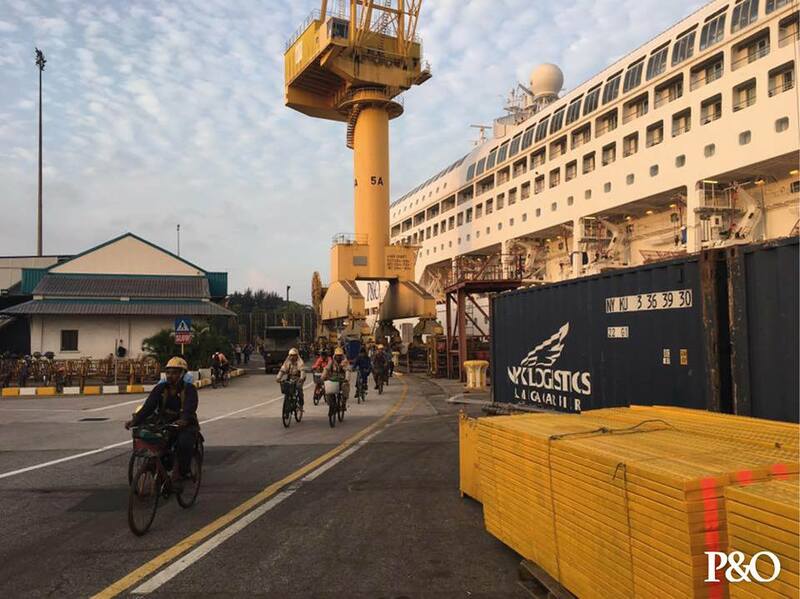 Your Pacific Dawn cruise will now depart on Friday 3rd March, but please be assured we are making arrangements for your overnight accommodation and comfort in Singapore. Please make your way to the Singapore Cruise Centre tomorrow (Thursday March 2) at your original check-in time. Once you arrive at the Singapore Cruise Centre, you will be directed to shuttle buses to take you to hotel accommodation that has been arranged for you by P&O. On Friday, you will then be transferred from your hotel to the Marina Bay Sands Cruise Terminal to embark Pacific Dawn. Full details on transfer and embarkation times will be provided at your hotel. Due to the later departure from Singapore, the itinerary will be revised slightly, and Pacific Dawn will call to Benoa & Komodo Island one day later than scheduled. In addition, we will no longer be calling to Dili. The rest of the itinerary remains as scheduled. In recognition of the delay, we are in the process of arranging a refund of one day of you cruise fare. If you booked via a travel agent, this will processed back to your agent. If you booked directly with P&O, your refund will be processed back to your credit/debit card, or via cheque if you paid through BPAY. Please allow approximately 4 weeks to receive you refund. In addition, we will also cover any reasonable out of pocket expenses incurred as a result of this delay, such as for main meals. Please keep a hold of any receipts and a form will be provided to you onboard to complete. P&O Cruises sincerely apologises for the delay in the start of your much anticipated cruise on board Pacific Dawn. If you need to get in contact with us regarding this delay, please call our dedicated team on +61 2 9432 8543. PACIFIC DAWNS WATERSLIDES ARE GOING TO BE A WHOLE LOT OF FUN IN THE SUN! Debuting on Pacific Dawn in March 2017 with some of the most exhilarating features, here is your first look at the new waterslides going on Pacific Dawn! The two new waterslides will create a whole new level of family fun, for the young and for the adults. 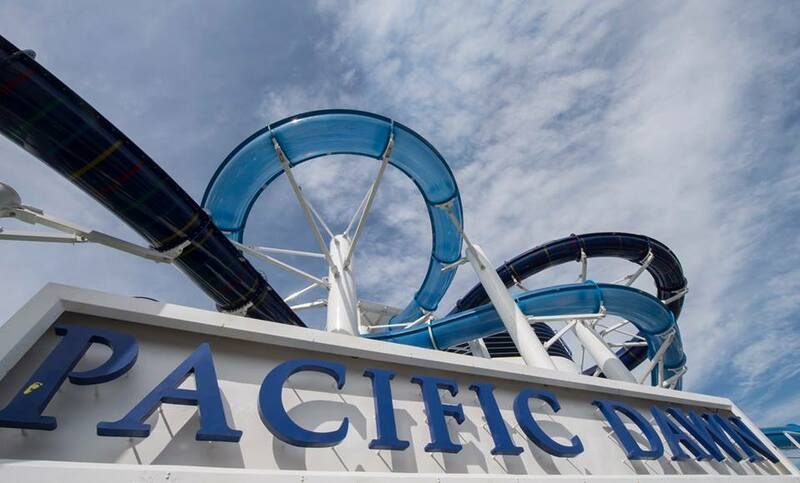 The waterslides will be down the back [ aft ] on Pacific Dawn and they will feature lots of twists and turns, that will be enough to even excite the most adventurist thrill seeker. 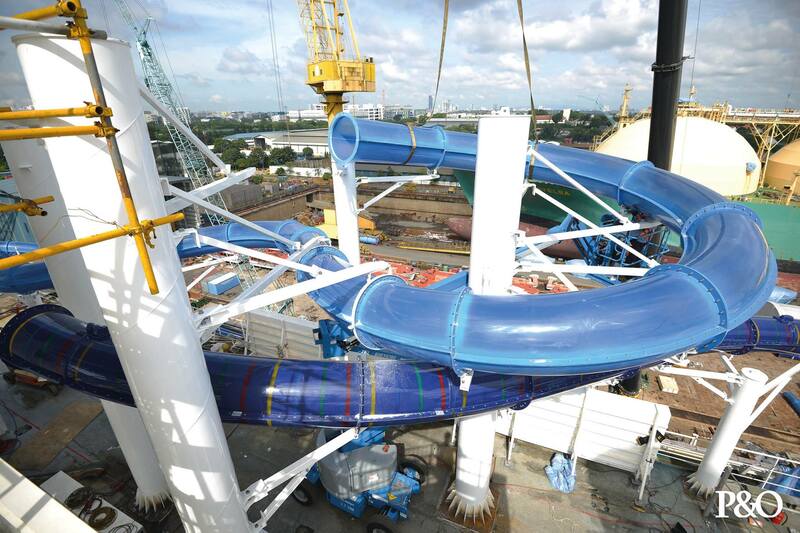 The two waterslides will snake their way off the ships funnel and they will also feature LED disco lights with a thumping sound system to boot ! The 1546-guest ship is turning 27 this year, having being built in 1990 and entered service as Regal Princess for Princess Cruises in 1991. Pacific Dawns last extensive refurbishment was in 2010 and had new activities such as The Edge added in 2014 along with the refurbishment of the Waterfront restaurant. 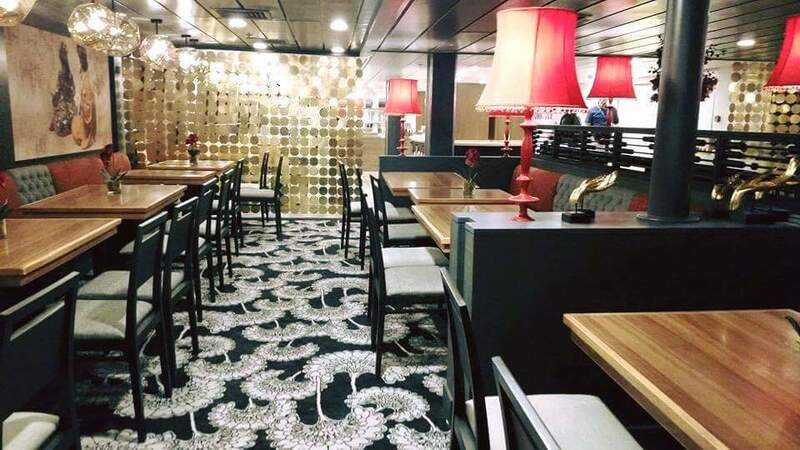 In a statement from P&O Cruises Australia, P&O Cruises President Sture Myrmell said the refurbishment would kick off a big year for the cruise line in Queensland. 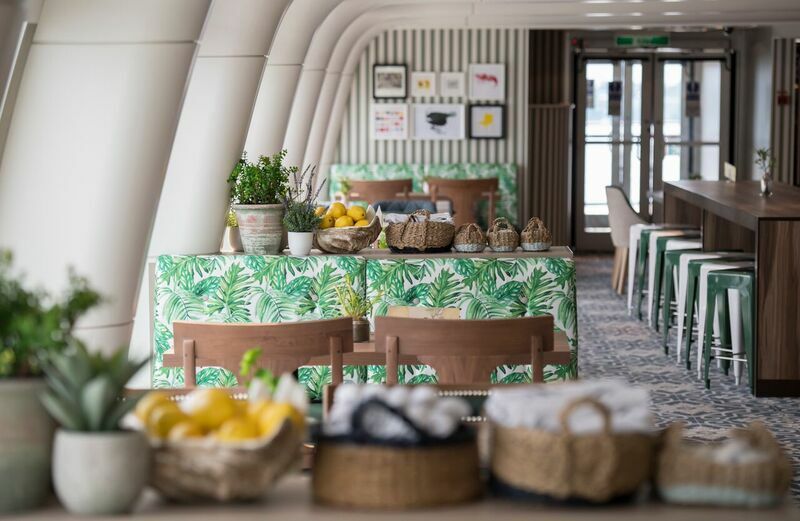 “With the new waterpark, dining options and a refreshed interior design, we’re creating a great new look for Pacific Dawn which will combine some fun innovations with the winning features of our existing ships,” Mr Myrmell said. Pacific Dawn is one of Australia’s much loved cruise ships, and Queenslanders have certainly taken to her like a duck to water. Pacific Dawn is going to look absolutely stunning when she returns from her refurbishment which is happening right now in Singapore as we speak, she reurns to her homeport of Brisbane on the 16th of March 2017. A TRUE QUEEN OF THE SEAS TO HOME PORT IN AUSTRALIA IN 2019 ! A True Queen Of The Seas Set To Homeport In Australia In 2019 ! Cunard Line has just announced that Queen Elizabeth will homport in Australia in 2019, the stunning vessel will spend two months plying Australian waters in 2019, this will be by far the longest deployment in Australia by any of the current ships in the Cunard Line fleet. 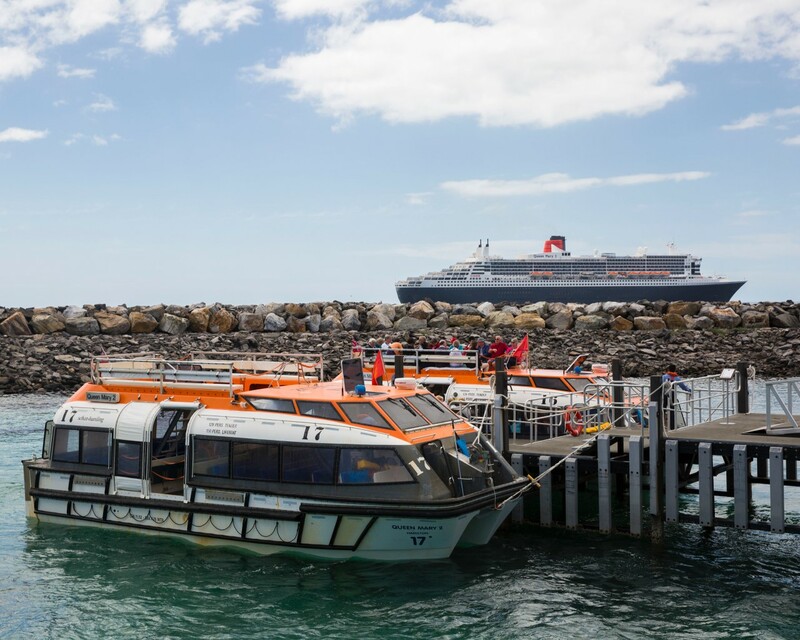 Queen Elizabeth will offer seven different cruises from Sydney and Melbourne, including two trans-Tasman voyages, three to Tasmania and two stopping by South Australia. Cunard Lines Australian itineraries will be part of Queen Elizabeths 2019 world voyage program, which will be advertised from the 14th of March 2017, they will go on sale from the 30th of March 2017. 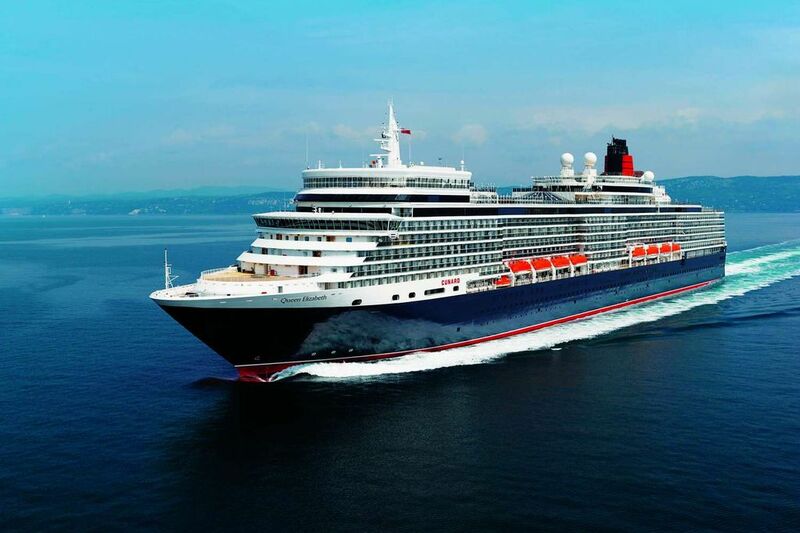 Cunard's vice president of international development David Rousham said Queen Elizabeth's local 2019 season would offer a total of 27 combination itineraries. "This will be the first time that Cunard has featured so many voyages to and from Melbourne in addition to Sydney, and will give Australians a much greater number of options to experience Cunard than ever before," Rousham said. Information supplied by: Cunard Line. Photo supplied by: Cunard Line. P&O CRUISES SAVES THE DAY, WHEN WEDDED BLISS SHOULD HAVE GONE OFF WITH OUT A HITCH ! Wedded Bliss Goes Off With Out A Hitch ! 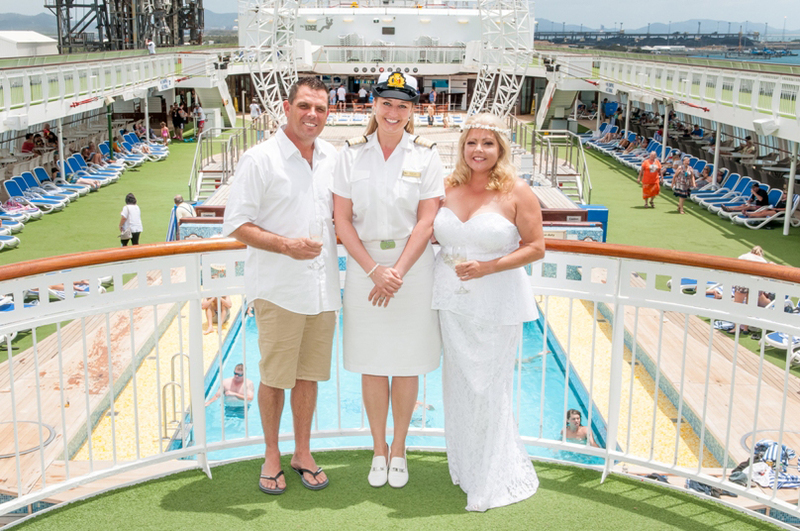 What a happy ending for a Port Macquarie couple, Christine Drennan and her husband to be Matthew Moore, they are currently sailing on P&O Cruises Australia’s Pacific Jewel and had planned a beautiful beach wedding at Mooloolaba which is on the Sunshine Coast Wednesday this week. Unfortunately their wedding celebrant Gail Evans was at the beach in Moolooaba waiting for them, but due to strong winds and a rough swell this prevented the tender boats from taking passengers ashore including the bride and groom. The wedding was off, or so it thought! But wait a minute, Pacific Jewel Hotel Director Melissa Yates who Australian Cruising News .com.au has got to know over many cruises on Pacific Jewel had other ideas. She had arranged for a special commitment service to be held on-board Pacific Jewel and while Captain Otty Ghoshroy couldn’t legally marry the couple, the rest of the day went ahead as planned with champagne, a wedding cake and a reception dinner in the ship’s main dining room. The bride even wore her beautiful wedding dress. To ensure the couple still officially became man and wife, P&O arranged for Ms Evans to fly to Gladstone to conduct the wedding yesterday. The ceremony was held in The Dome at the front of the ship, with stunning views of the Queensland coast. 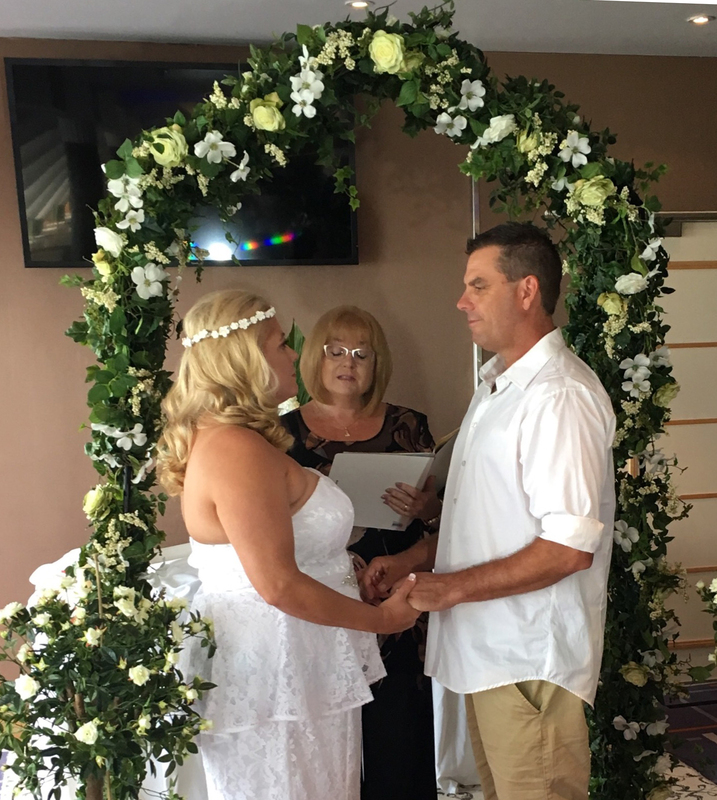 Matthew Moore and Christine Drennan were officially married on Pacific Jewel in Gladstone on Thursday this week. .
Cupid's arrow might have hit a day later than planned but love and romance got there in the end. Well done to P&O Cruises Australia and Melissa Yates and to all those involved. We also wish the happy couple [husband and wife] a lifetime time of happiness together. So do you have a similar story to tell?? Leave us your comments below and tell us your story. THE DAWN OF A NEW ERA IN CRUISING STARTS NOW FOR PACIFIC DAWN! 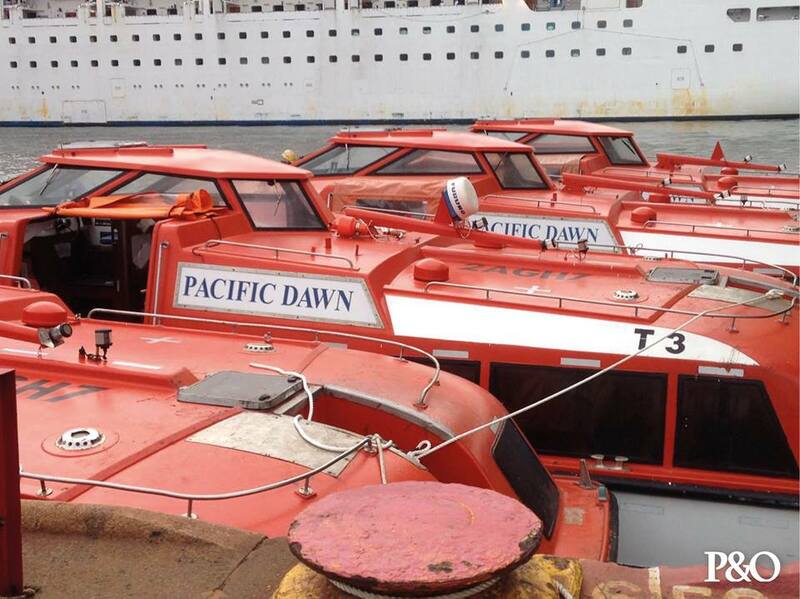 The Dawn Of A New Era In Cruising Starts Now Pacific Dawn! As brought to you Exclusively by Australian Cruising News .com.au on the 18th of July 2016, please see original story and photos on our website under cruising news. 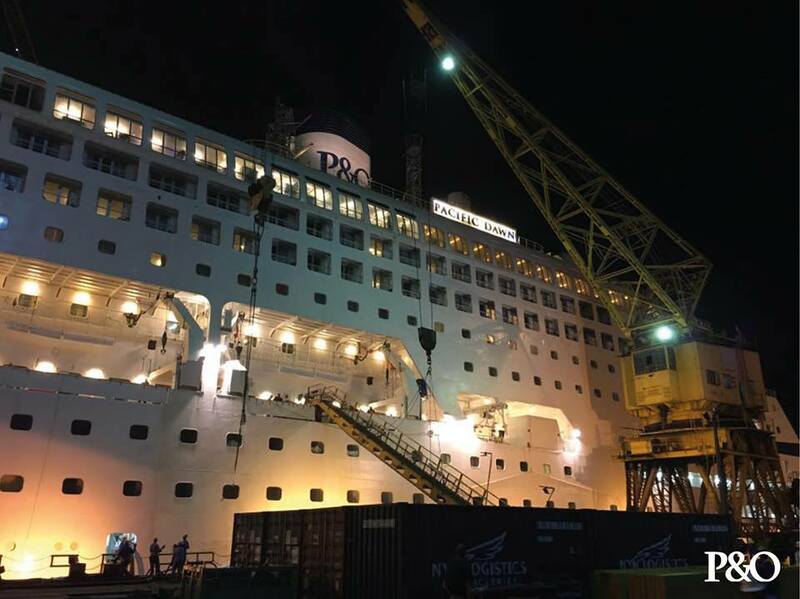 Pacific Dawn which is now the second oldest ship in the P&O Cruises Australia fleet is now in Singapore and having a total refurbishment both inside and out! Pacific Dawn has just begun her multi-million dollar renewal, this will include the installation of two spectacular waterslides on her top decks. Over the coming days, the ship will be fitted with a range of new features including a state-of-the-art waterpark [minus one pool] and the addition of The Pantry which is on all of the P&O Cruises Australia ships apart from Pacific Dawn, an international market place of fresh food outlets which will replace the traditional ship buffet. Among its features will be a new Mediterranean-inspired offering called Nic and Toni’s and a new seafood restaurant, Shell & Bones. Many of Pacific Dawn’s public spaces – including the Atrium, Charlie’s Cafe, The Orient and the Promenade Bar – will also be modernised to fall into line with the startling contemporary look which has become an underlining feature on both Pacific Aria and Pacific Eden. 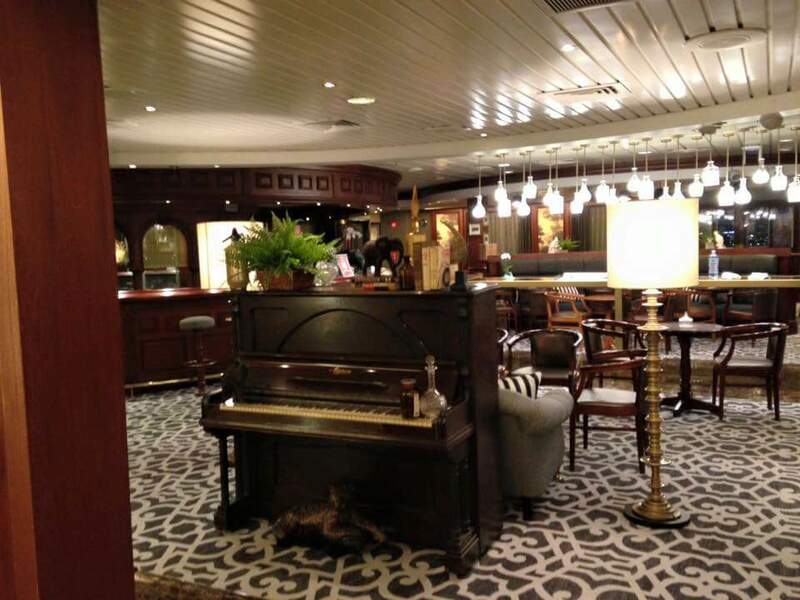 The refit comes as P&O prepares for its biggest year of Queensland cruising, with two ships sailing from Brisbane year round. Between them, Pacific Dawn and Pacific Aria will offer a record 108 cruises to holidaymakers this year, up from 98 cruises in 2016. Pacific Dawn will depart from Singapore on the 02nd of March and will arrive back into Brisbane her homeport with her additional new features on the 16th of March. For more information contact your local travel agent or visit pocruises.com.au, call 13 24 94. SYDNEY SET TO CELEBRATE WITH THE 10TH ANNIVERSARY OF THE WORLDS GREATEST OCEAN LINER, QUEEN MARY 2 VISIT ! Queen Mary 2 To Celebrate Its 10th Anniversary Visit To Sydney,Australia. While All The Attention Recently Has Been On Ovation Of The Seas, Celebrity Solstice, And The South Pacific twins Explorer And Voyager Of The Seas plus the local contingent of Australian homeported cruise ships, don’t you think it’s now time to bring in the BIG guns ! On Saturday the 25th of February 2017 Sydney, Australia will all geared up for the 10th anniversary visit of Queen Mary 2, the worlds most famous ocean liner has already been making many exciting visits to many ports in Australia already. The newly remastered Cunard flagship was anchored off Kangaroo Island on Monday, QM2 is 345-metres long making it become the largest ship ever to visit the South Australian Island. During the inaugural call, the ship’s 2700 guests enjoyed a day of sightseeing including tours to Seal Bay Conservation Park, Vivonne Bay, Cape Willoughby, Flinders Chase National Park and the ‘Remarkable Rocks’, as well as the opportunity to taste local produce. 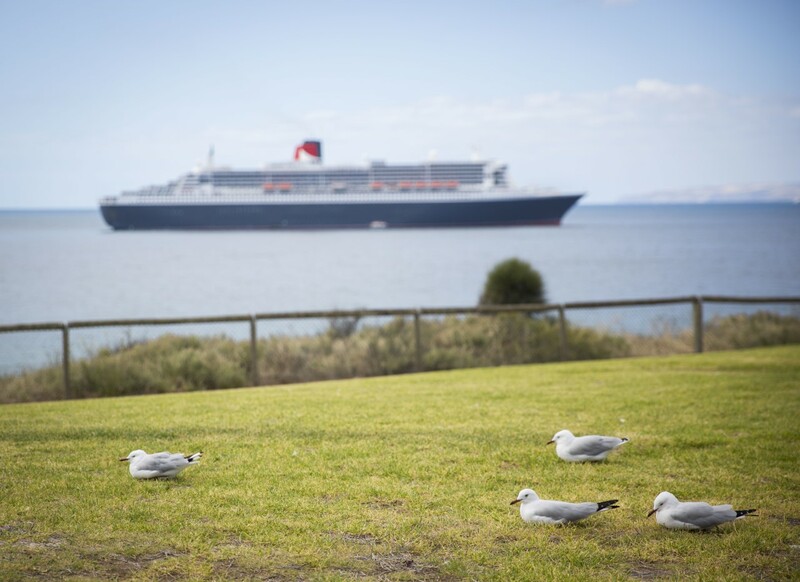 The Kangaroo Island call was part of Queen Mary 2’s first short roundtrip cruise from Melbourne and is one of four maiden Australian visits for the liner this year, with visits to Busselton in Western Australia, and Port Arthur and Hobart in Tasmania also on her itinerary. Queen Mary 2 is set to mark ten years since her memorable first visit to Australia in 2007 with a spectacular rendezvous with sister ship Queen Elizabeth in Sydney Harbour on Saturday. Australian Cruising News.com.au will be out and about on Sydney harbour to capture all the action for you. Photos Credit: ship’s chief photographer Mike Crompton. OVATION OF THE SEAS LEAVES HER MARK ON SYDNEY BEFORE A FINAL DEPARTURE, AS A MOMENTOUS AUSTRALIAN SEASON COMES TO AN END ! You Want It, Ovation Of The Seas Has Got It! Ovation of the Seas has made Australia her own while on debut on the 15th December 2016. While it was a very overcast day she arrived into Sydney, Australia with much fan-fare. Royal Caribbean International had always promised Australian’s that it was going to introduce a new style of holiday, hence the hash tag #SuperCruising was born! The magnitude of spectacular and exhilarating experiences found only on a Royal Caribbean International ship, including sky diving and surfing experiences, the North Star viewing capsule, bumper cars, the robotic Bionic Bar and 18 different dining options and spell-binding entertainment is unbelievable ! It has to be seen to be believed. “What a spectacular few months! Ovation of the Seas has wowed more than 40,000 guests with her incredible features and service. We are thrilled with the success of her maiden season and cannot wait to welcome her back again in November,” said Adam Armstrong, managing director, Royal Caribbean Australia & NZ. “As well as offering guests a new way to holiday down under, the #SuperCruising vessel also had a huge impact on the Australian economy, injecting more than $35 million in passenger spend alone,” he said. Well dont worry Australian Royal Caribbean International fans, because The biggest, newest and most modern cruise ship to ever be based in Australia will return next summer, joining sister ships Explorer of the Seas, Voyager of the Seas and Radiance of the Seas sailing from the region’s home of cruising, Sydney. Ovation of the Seas departs Sydney at 6.30pm today for her 14-night repositioning voyage to Singapore. 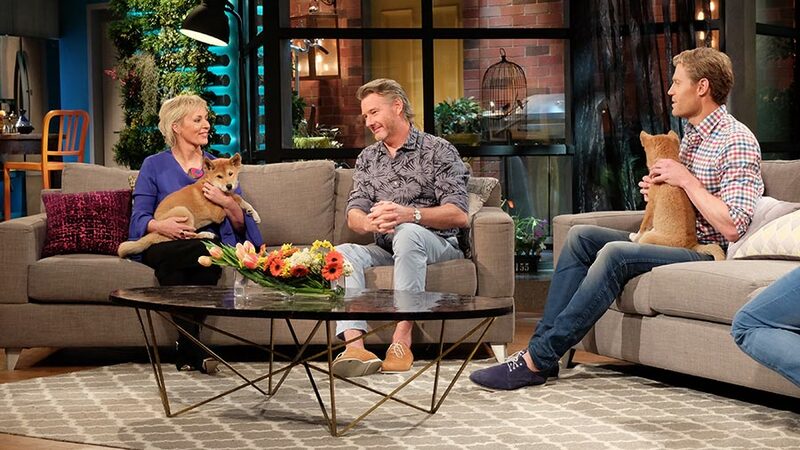 SHANNAN PONTON TO FEATURE ON CHANNEL TEN'S 'THE LIVING ROOM" TONIGHT AND NEXT WEEK. Shannan Ponton To Feature On Channel Ten's "The Living Room"
Popular TV host and leading fitness trainer Shannan Ponton has jumped back on-board Carnival Cruise Line for a special appearance as a guest presenter on TEN’s award-winning lifestyle program, The Living Room. A regular on Carnival's Australian-based ships, Shannan has filmed two special pieces on-board Carnival Legend. The first story, to air at 7.30pm this Friday, February 17, on TEN, features Shannan showing just what it takes to keep shipshape at sea, including easy on-board fitness tips like taking the stairs, joining the gym and jogging the top deck track. 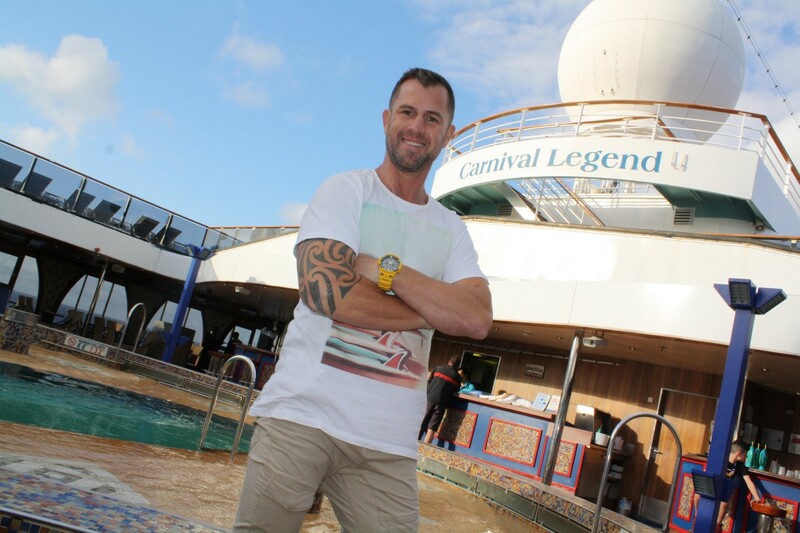 Shannan then surprises his fellow passengers by hosting a Biggest Bootcamp at Sea workout. In the second story, to air on Friday February 24, Shannan spends an action-packed day on New Caledonia's island of Lifou enjoying Carnival's amazing shore excursions. Shannan starts his day off with a visit to the Devil’s Cave to explore local legends and culture before making his way to the Secret Grotto, an enchanting cave with a natural swimming hole inside. Finally, Shannan heads to the famous Jinek Bay to see Lifou’s incredible marine life in crystal clear waters. Information supplied by: Carnival Cruise Line, Australia. Australian Cruising News.com.au The HOME Of Australian Cruising! CRUISING 2017 AND BEYOND, WHAT DOES THIS ALL MEAN FOR YOU. Cruising 2017 And Beyond, What Does All This Mean For You. Late December 2016 saw the release of the annual Cruise Industry Outlook Report from CLIA which analyses statistics and trends that are likely to emerge over the course of the next cruising year. As in most years previously, the report was particularly optimistic. It showed a range of positive trends from more itineraries on offer to local industry growth and further investment worldwide into better infrastructure to meet the growing demand for diversity in cruise markets. But what does this all mean for you? To take the grunt work out of trying to understand the figures, we have broken down the trimmings of the report into 5 key benefits Aussie cruisers will see as..
Australia has long been a destination for cruising, both domestically and for tourism. As this trend continues to grow (almost 1,000,000 Australians – approximately 4% of the population will take to the seas this year) so will the itineraries on offer along with better pricing and overall buying power of the everyday cruiser. We have seen this already from the investment in new cruise terminals in Queensland, as well as dedicated regional vessels from Carnival and P&O Cruise Lines. Royal Caribbean have begun to operate more in the South Pacific as well with more sailings from Celebrity and Azamara brands and the first taste of super cruising with the world’s premier mega-liner; The Ovation of the Seas. Asia has been flagged as the fastest emerging market in the cruise industry with the demand for more itineraries seeing regularly scheduled European and Alaskan voyages being repositioned to meet growing demand. The numbers are staggering (close to a 26% growth per year for the last 4 years) and with our close proximity to the region an inevitable range of amazing new ports and untouched itineraries in the orient will begin to emerge, offering Aussie cruisers the chance to experience cruising like never before. As an added benefit to this, off season cruising and the presence of more specialized vessels in the region will mean more select and unique itineraries begin to emerge in Australian waters as well. 3. Adventure cruising to become more accessible. The trend for adventure cruises has been on the rise steadily over the past 10 years with more people seeking unique experiences and itineraries outside of traditional holiday destinations. The big ticket items in this category are destinations such as Antarctica, The Northern Territory and even private island experiences that are starting to be offered by some companies. The growth in popularity (as well as proximity of Australians) to many of these destinations means once again greater affordability and means of access to these locations, backed by a combined industry total investment of $6.8 Billion in specialty ships to meet the growing need and requirements for voyages of this type. 4. Overnight stays and longer shore excursions. Overnight stays on port calls are officially on the rise as cruise lines begin to integrate more excursions and experiential activities into itineraries abroad. This change in tact has seen a rise in popularity reported from various leading liners and is sure to excite many cruisers and travel enthusiasts alike as more unique itineraries that could only be experienced from cruising begin to emerge. Cruise passengers can now make the most of their stay in ports of call. This especially benefits Aussies who prefer traveling for a longer period. 5. Smooth booking experience with more travel agents to work with. The CLIA membership community has 15,000 travel agencies and over 25,000 travel agent members worldwide. Australians that are sailing away for the holidays will find it easier to book the perfect cruise with the matchmaking expertise of cruise travel specialists. Eight out of 10 CLIA-certified travel agents are also confident they’ll see an increase in bookings from last year. First-time Australian cruisers can enjoy a hassle-free vacation by working with travel agents. The rise in cruise travel agents can attract even travel enthusiasts that usually plan their trips on their own to let someone take care of their bookings. Cruise Vacations, after all, should be a time for relaxation, reflection their just a great way to holiday. BRISBANES PROPOSED CRUISE SHIP TERMINAL RECEIVES 80% OF THE REQUIRED APPROVAL FOR CONSTRUCTION ! 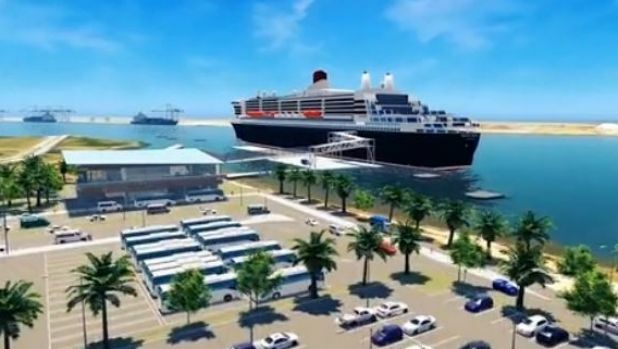 Brisbanes Proposed Cruise Ship Terminal Receives 80% Of The Required Approval For Construction. The market-led proposal to build Brisbane’s new cruise terminal has reached its next crucial benchmark having now received 80 per cent of the required approvals for construction. The final hurdle for the much anticipated terminal will be the approval of State Cabinet, which if successful will see construction begin as early as October 2017, with a view for completion before the end of 2019. Luggage Point is the proposed location for the new facility for its ability to cater to ‘mega vessels’. The site is in close proximity to the Brisbane Airport and has access to deep water, making for reduced dredging requirements. 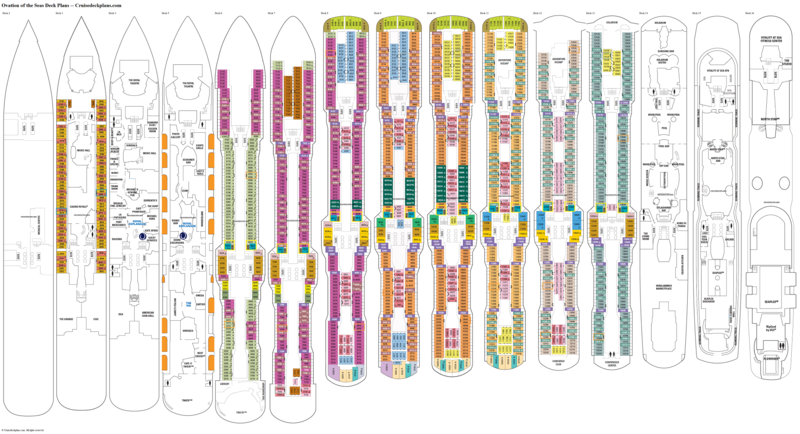 Any main cargo-related activities are done in a separate area. Brisbane to be able to accommodate mega cruise ships Currently, Brisbane’s cruise terminal located in Hamilton can only accommodate ships of up to 270 metres in length. Once the cruise terminal project materializes, mega cruise ships with lengths exceeding 270 metres will be able to berth in Brisbane. Today’s largest cruise ships are over 300 metres in length. This includes marvels such as Royal Caribbean's Allure of the Seas that measures 362 metres, with a passenger capacity of 6296, and Anthem of the Seas, measuring 348 metres and can carry 4095 passengers. 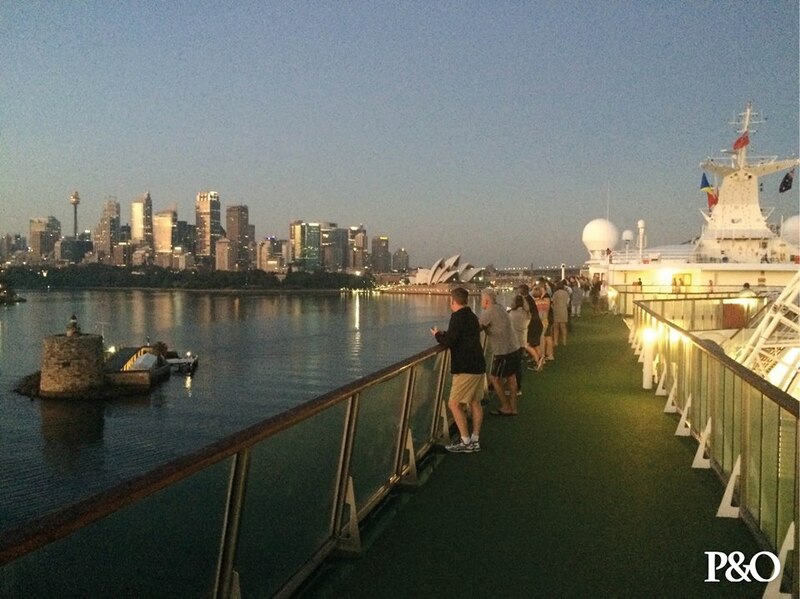 According to the Port of Brisbane, 62% of cruise vessels are expected to be over 270 metres in length come 2020. The proposed cruise ship terminal project is privately-funded. Taxpayers will not have to shoulder the construction cost. Two of the world’s largest cruise companies - Royal Caribbean International and Carnival Corporation - will spearhead the building of the terminal. The cruise terminal project has the full support of the cruise industry, with Royal Caribbean and Carnival Cruises partnering with the Port of Brisbane to make this $100 million international mega ship cruise facility a reality. Once operational, the facility will be able to accommodate more vessel calls. The Cruise industry is a major player in Australia’s economy According to Business Queensland, Queensland remains Australia’s second-largest cruise holiday market. In 2014, 23.6% percent of the total number of cruise passengers were from Queensland. Cruising also plays a significant role in Australia’s tourism industry. Cruise markets in Australia saw 20% per annum average growth for the past decade. With the new cruise terminal project, this market share is expected to grow even more. There will be a dedicated facility to support the influx of cruise passengers, both domestic and international. PBPL estimates a $1 billion annual gross injection into the Queensland economy once the project becomes operational. This tourism infrastructure is poised to potentially triple the size of Brisbane’s cruise industry over the next 20 years. Brisbane will be utilised as a base port. This means more passengers will be able to start and finish their cruise trips in Brisbane. The project will not only see Brisbane as a major cruise destination, it can also draw increased traffic to tourist destinations in the city and neighbouring regions. The cruise industry is optimistic about the progress the new cruise terminal project will bring. Are you looking forward to see the project come to life too? OVATION OF THE SEAS OWN WONDERLAND RESTAURANT MIXES UP SOME IMAGINATIVE COCKTAILS ! 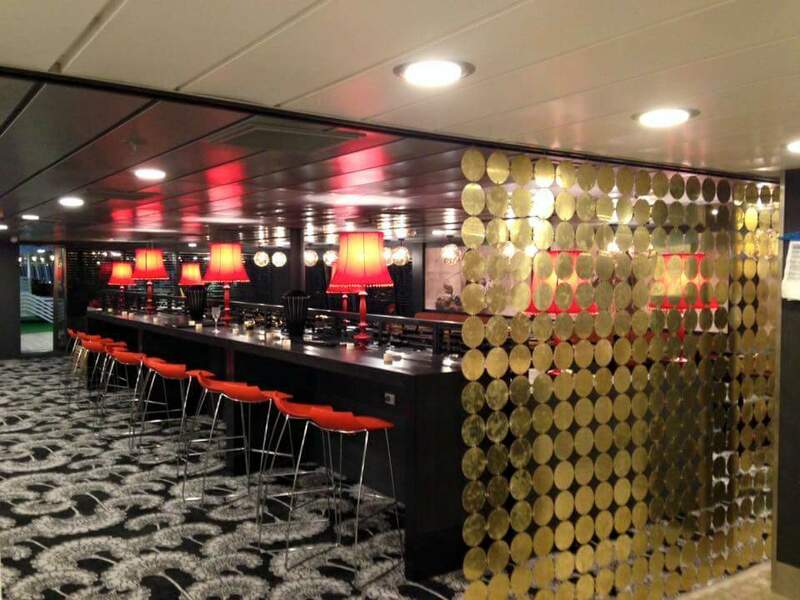 Ovation Of The Seas' Own Wonderland Restaurant Mixes Up Some Imaginative Cocktails ! 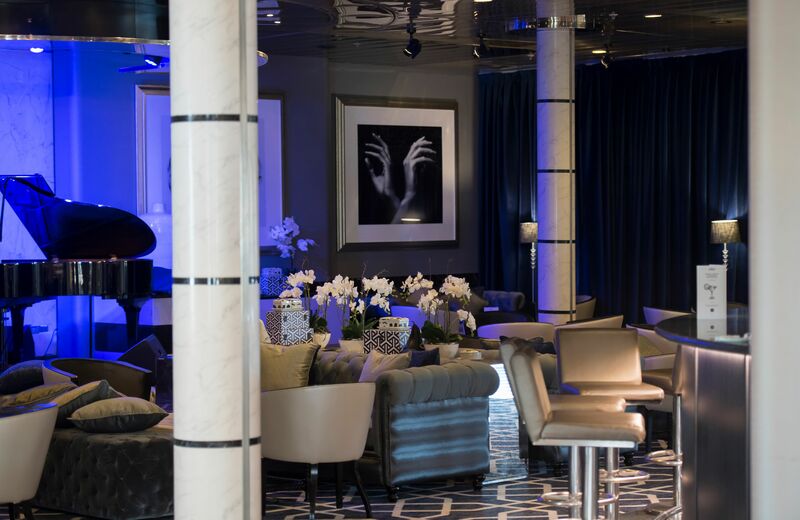 For the Royal Caribbeans master mixologists behind the bar at the Wonderland restaurant onboard Australia’s very own Ovation of the Seas, sister ships Allure of the Seas and Anthem of the Seas as well as the largest ship in the world Harmony of the Seas. 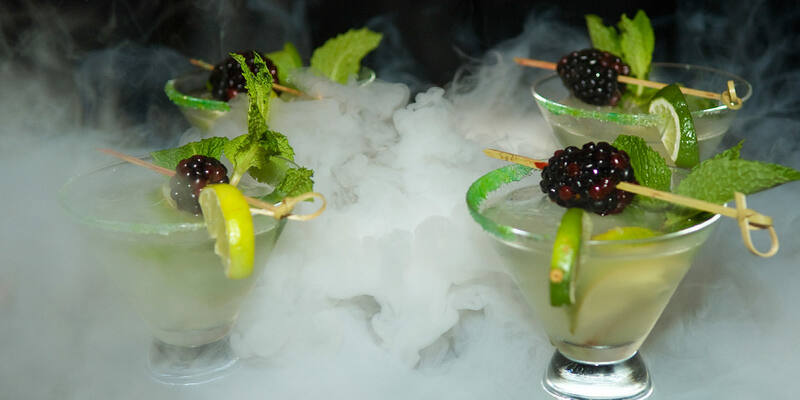 Wonderland, cocktails are more than just drinks – they are masterpieces. These artists use innovative flavors and artisanal ingredients to create cocktails that are almost too stunning to drink! Below are just some of the Imaginative cocktails that you could experiance at Wonderlands' restaurant bar on board our very own Ovation Of The Seas ! Bitter cocoa powder and mascarpone cheese are churned together with dark crème de cocoa and vanilla vodka made super indulgent with the addition of a Guinness float and a rim of Synsepalum dulcificum. Mango purée and fresh cilantro pair up nicely with Bombay Sapphire gin in a grown-up trip down memory lane, and a sweet finish is delivered via a fleur du sel garnish. Peanut vodka has a field day with team mates such as nougat cream liquour, white crème de cocoa and caramel syrup. Maker’s Mark bourbon, sweet vermouth and salt water taffy simple syrup deliver a different kind of grown-up trip down memory lane. A sweet finish arrives via a crown of fleur du sel. CARNIVAL HUB APP FINALLY GETS INTRODUCED TO AUSTRALIANS ! 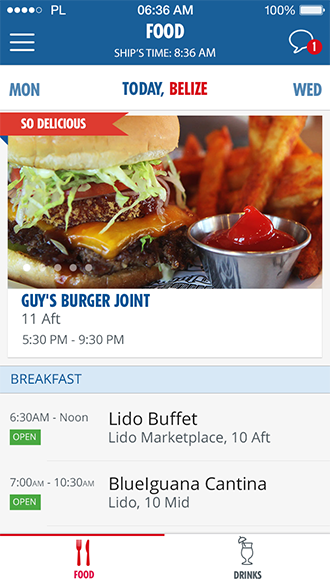 Carnival Cruise Line, Australia Finally Introduces The Carnival Hub App To Australians! 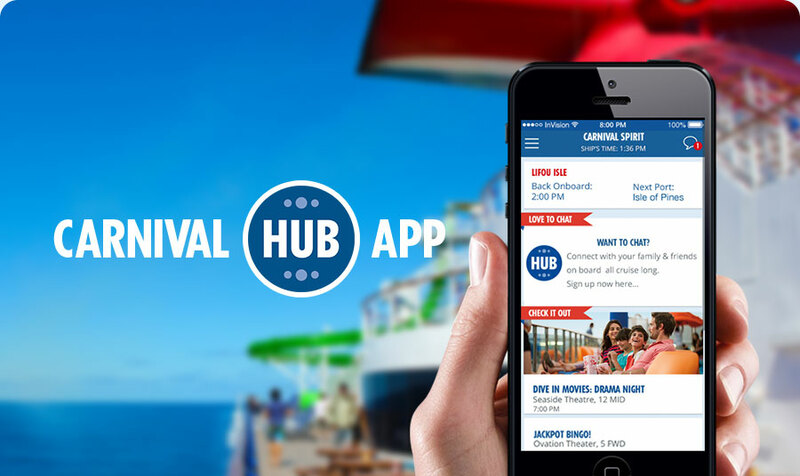 Carnival Hub a free mobile app by Carnival Cruise Line, has finally been introduced on its Australia based ships, Carnival Spirit and Carnival Legend. 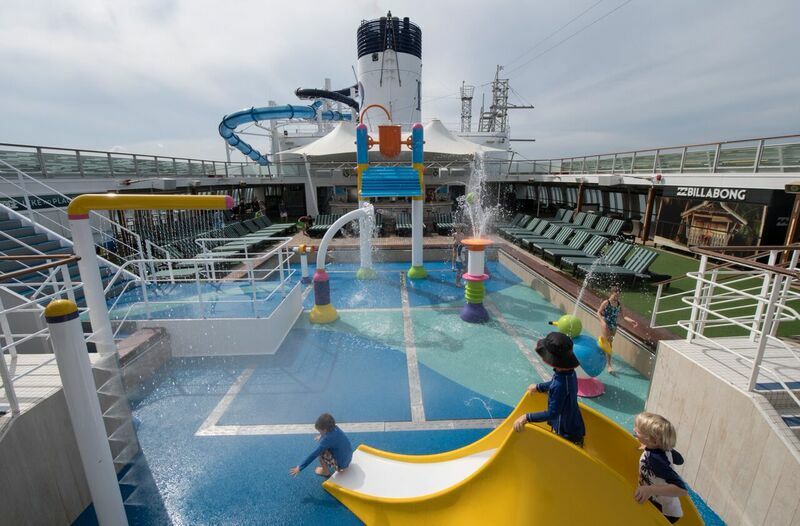 It’s helping guests get instant access to all the fun on-board., and it’s about time I say. Those who are cruising on both Carnival Spirit and Carnival Legend will be able to use the Carnival Hub App once on board. So what are some of the features of the Carnival Hub app?? What's Happening: A day-by-day schedule of hundreds of on-board events, available for the full cruise as soon as you embark! 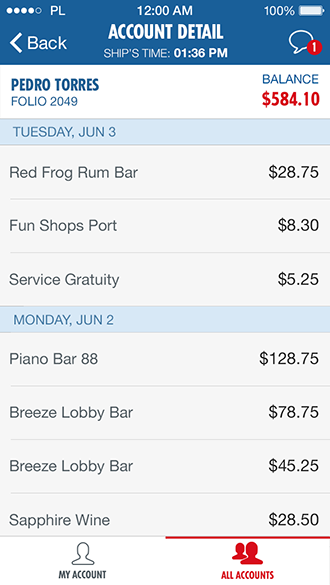 Includes a “favourites” feature that also allows guests to see which events their sailing companions will attend. Food & Drinks: A comprehensive list of delicious dining options and dining-related events, enticing refreshment venues and beverage-related events. 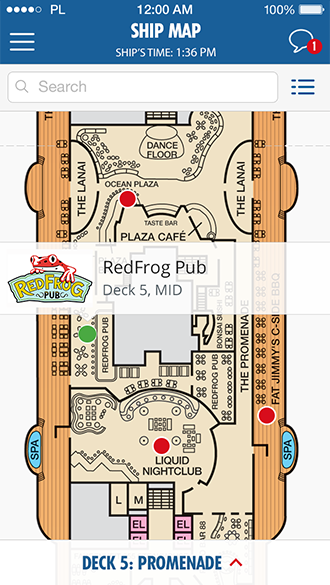 Deck Plans: Searchable deck plans with key areas highlighted, providing a comprehensive layout of the ship’s various on-board offerings. On-board Chat Access: The opportunity to chat with family & friends on board all cruise long from the comfort of your deck chair is for a one-off fee per cruise of AU$9, per person per voyage. The Carnival Hub App is now available on Carnival Spirit and will become available on Carnival Legend as of the 23rd of February 2017. You can download the app for free from the ITunes store for apple iPhone users, and for android users it’s available on the google play store. For those guests who are cruising on-board Carnival Spirit and Carnival Legend you are able to download the Carnival Hub app before you start your cruise, you are able to set up a profile and enter the cruise that you are going on. You can also enter the next cruise departure date to start the countdown and share with family and friends. Carnival Hub app can also be downloaded for free on-board by using a special internet package. 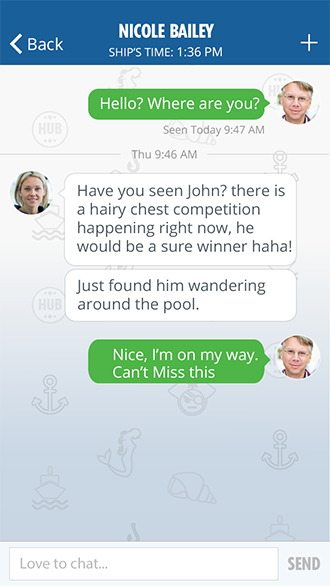 Carnival Cruise Line Vice President Jennifer Vandekreeke said the Carnival Hub app would change the way guests enjoyed their cruise holidays. The Carnival Hub app really puts guests in control of their cruise holiday, so they never miss any of the fun on-board, and can easily plan their day from beside the pool, hop from a live show to a gym class, arrange to meet friends and family and even catch up with new friends,” Ms Vandekreeke said. New functions, like the ability to make spa and restaurant bookings were expected to come online throughout the year, she said. It is also interesting to note that the ‘Fun Ships’ Fun Times daily newsletter will also be available in a reduced-size paper format, along with the Carnival Hub app. This certainly shows on Carnivals behalf that they are committed to being environmentally friendly. This will see the paper used to print the newsletter on-board be reduced by 50 percent. Information supplied by: Carnival Cruise Line , Australia. 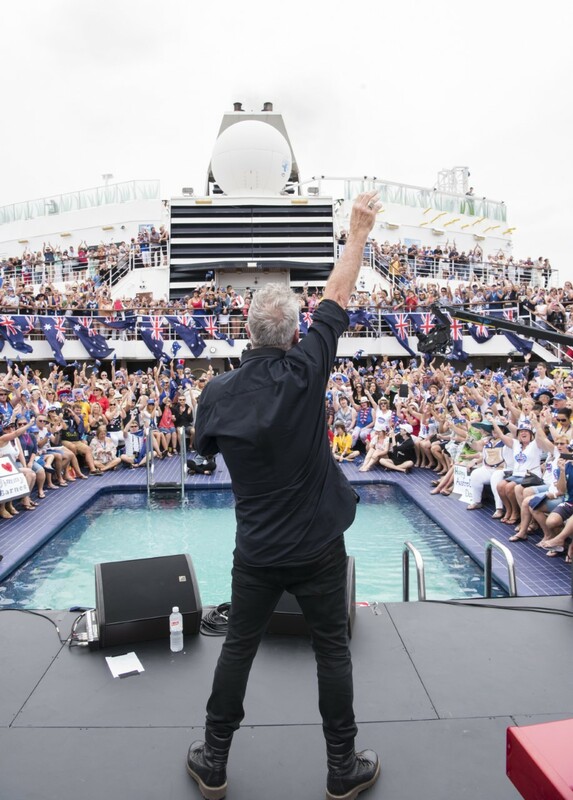 JIMMY BARNES ROCKS AUSTRALIA DAY 2017 ON BOARD PACIFIC EDEN ! Jimmy Barnes Rocks Australia Day 2017 On Board Pacific Eden. Over 5000 cruislings have celebrated Australia Day on three P&O Cruises Australia cruise ships on Sydney Harbour. 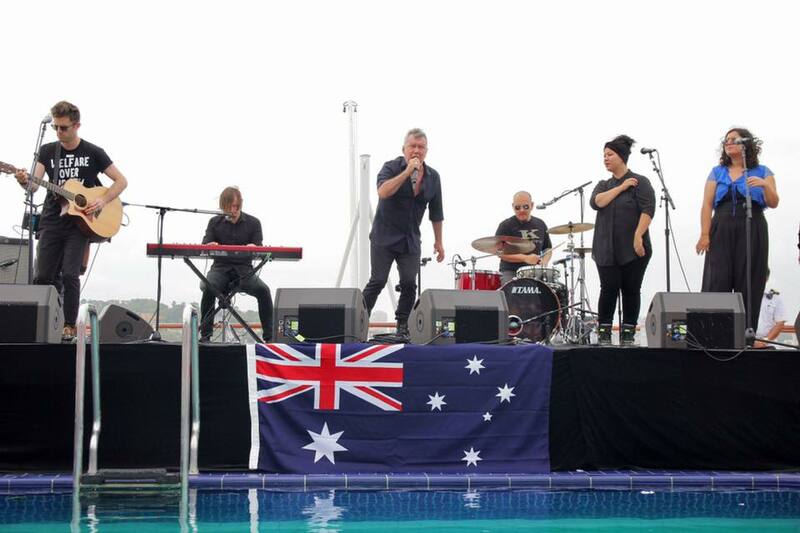 While guests onboard Pacific Eden enjoyed a surprise concert by Australian rock royalty Jimmy Barnes. Jimmy – who was appointed an Officer of the Order of Australia in today’s Australia Day Honours – kicked off his special morning acoustic performance with the popular Flame Trees, performing to hundreds of guests on Pacific Eden’s Oasis pool deck, against the backdrop of Sydney. P&O Cruises Australia ships have played an integral part on Australia Day on Sydney harbour for the past five years. This year sees P&O Cruises Australia up the Ante with Australia day celebrations on Pacific Eden, Pacific Pearl and Pacific Dawn all will be berthed in Sydney for the day’s celebrations. As part of the cruise line’s Great Australian Deck Party, guests are enjoying front row seats to all the Harbour activity as well as a day of Australian movies and food including a BBQ, green and gold pancakes and lamingtons. P&O Cruises President Sture Myrmell said Australia Day was a big day on the cruise line’s calendar. “As Australia’s only homegrown cruise line, as well as the nation’s largest cruise line, Australia Day is a big event for us and we’ve very proud to celebrate it with more than 9000 guests across our five ships today,” Mr Myrmell said. 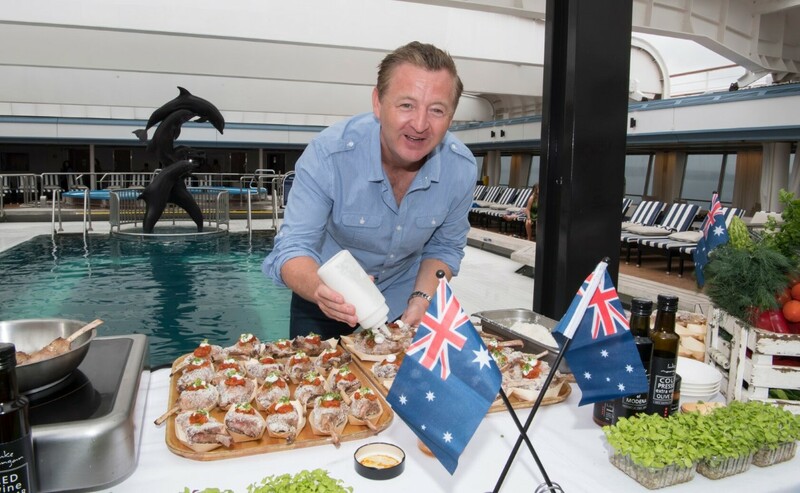 Popular Australian chef Luke Mangan – who has restaurants across P&O’s fleet – was also onboard Pacific Eden during the day, creating a deconstructed “lamb-ington” treat for guests. All three P&O Cruises Australia ships that are on Sydney Harbour departed the same evening, with Pacific Pearl returning on Friday the 27th of January this cruise will be her last return voyage to Sydney before making her way to New Zealand for her final cruises and ending her time in the P&O Cruises Australia fleet. Pacific Eden will be sailing back into Sydney on Saturday the 28th of January while Pacific Dawn will be cruising back to its homeport of Brisbane. Both the Pacific Aria and Pacific Jewel are both spending the day at sea. 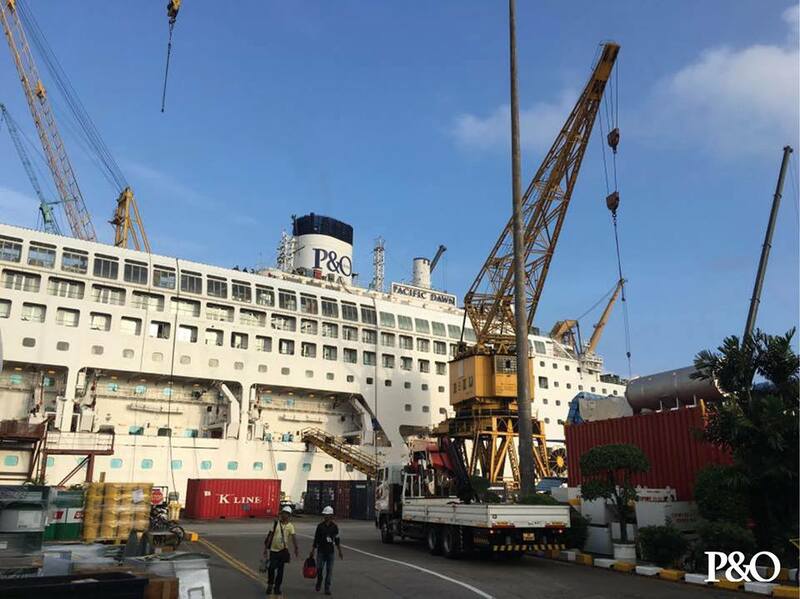 BERTHING ARRANGEMENTS AT OVERSEAS PASSENGER TERMINAL COME TO AHEAD! Berthing Arrangements At Overseas Passenger Terminal Come To A Head! In another embarrassment for Sydney ports Royal Caribbean International has had to decide which one of its ships will berth at the Overseas Passenger Terminal at Circular Quay. This has happened because Radiance Of The Seas And Ovation Of The Seas are scheduled to berth at the same time, both ships are scheduled in Sydney on the 28th of January 2017 and the 09th of February 2017. As we all know this cannot happen and is showing the lack of berthing facilities east of the harbour bridge. In an embarrassing situation that Royal Caribbean International has been put into, the smaller of the two ships [Radiance of The Seas] has been forced to sit at anchor at Athol Buoy. The check-in and embarkation for Radiance of the Seas, departing 20th of January 2017 will take place as normal at the Overseas Passenger Terminal, Circular Quay in Sydney, Australia. http://www.royalcaribbean.com.au/contentWithGallery.do?pagename=itinerary you will be ferried to a dedicated Royal Caribbean International marquee that will be set up next to the White Bay cruise ship terminal. The dates that are affected by these changes are as follows: 20th, 28th January 2017 and the 09th February 2017. For further information please contact www.royalcaribbeaninternational.com.au on: 1800 754 500. While it’s not possible to see two big ships berthed at the Overseas Passenger Terminal at the same time, the situation at hand certainly presents some big issues that Sydney ports need to address! Sydney ports you need to take some action now ! EXTRAORDINARY PAINTING OF OVATION OF THE SEAS HANDED TO CAPTAIN HENRIK LOY IN 'GIVING BACK' CEREMONY ! While On Board Ovation Of The Seas on Tuesday the 09th of January 2017, www.australiancruisingnews.com.au was invited to a ‘giving back’ceremony. 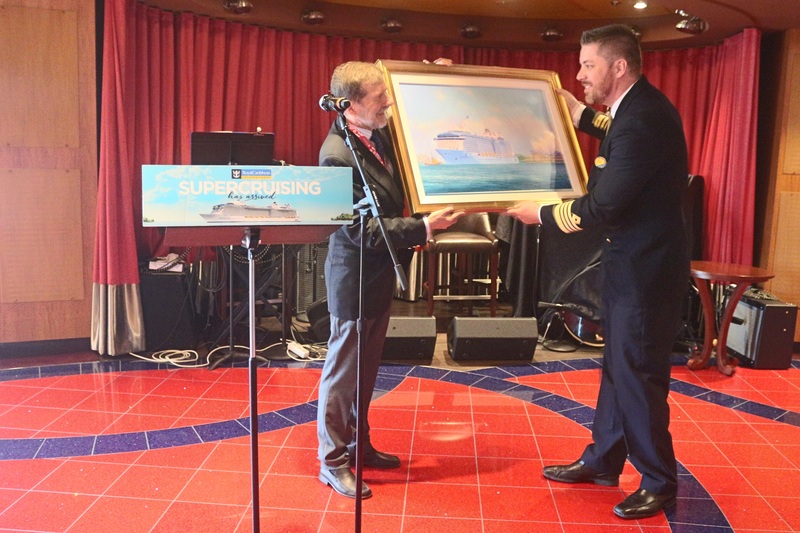 Stan Stefaniak who is a marine artist presented Ovation Of The Seas Captain Henrik Loy with an original painting of the ship. The tradition for Royal Caribbean International and Stan first started back to 2011. 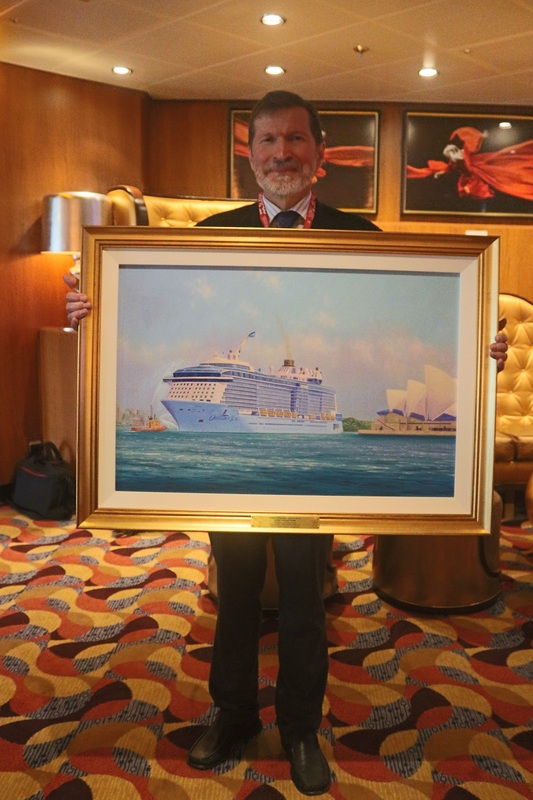 2011 was the first time that Radiance of the Seas have ever visited Sydney and yesterday marked the fifth occasion where such a commission of such a painting Stefaniak had received. Born in Sydney, Stan’s passion for painting maritime scenes stems from virtually a lifelong interest in shipping. The 1960’s and early 1970’s were years of fondly remembered countless ship visits after school in the port of Sydney, full of shipping activities with vessels belonging to numerous companies and countries of registry. From a very early age Stan developed a love of drawing and painting, but it was his love of ships that inspired him to paint maritime subjects. Stan’s enrolment in art classes at the Ross Davis painting studio in Sydney for a few years had developed his understanding of the use of colour which he expressively uses in his paintings. Several of Stan’s paintings have been used to illustrate covers for books about Australian and New Zealand shipping written by the well-known maritime historian Peter Plowman. His paintings are included in private collections in Australia and the United Kingdom, Royal Caribbean International Cruise Line, as well as on display in the Member’s Lounge at the Australian National Maritime Museum. Prints of his paintings have been sold through the shop at the Australian National Maritime Museum in Sydney and at the Maritime Centre, Newcastle. Feature articles about his paintings have been published in the Australian ‘Go Boating’ magazine and several issues of World Wide Cruising magazine. Adam Armstrong managing director for Royal Caribbean International for Australia and New Zealand said yesterday that a lot of VIP'S, Media, and Travel Agents had been thrown at Ovation Of The Seas for her inaugral season in Australia. Adam said that extraordinary gift that Stan has spent putting many man hours into, infact over two weeks painting honours the captain and crew aboard each of ships that have visited Australia, it's sign of gratitude from the local Royal Caribbean team for all the hard work that the captain and his crew have done. Pictured are : Stan Stefaniak, Marine Artist and Captain Henrik Loy, Ovation of the Seas. A spokesperson for Royal Caribbean International has informed www.australiancruisingnews.com.au that bookings for Ovation Of The Seas local sailings have been sailing at full capacity. A number of her up and coming sailings are completly sold out including both of Ovation Of The Seas five and eight night sailings to Tasmania. Ovation Of The Seas carries over 4,900 guests on each departure from Sydney, Australia with 85- 90% coming from the ever so popular Australian cruising market which is set to grow even further in the coming years. Photos Credit : Brian Gaskin Of www.australiancruisingnews.com.au The HOME Of Australian Cruising! INTERACTIVE GUEST EXPERIENCE PLATFORM OCEAN MEDALLION TO BE IMPLEMENTED BY CARNIVAL CORPORATION IN LATE 2017. Interactive Guest Experience Platform Ocean Medallion To Be Implemented In Late 2017. The world's largest leisure travel company with 10 global cruise line brands, today announced it has developed the world's first interactive guest experience platform capable of transforming vacation travel into a highly personalized and elevated level of customized service for millions of guests. 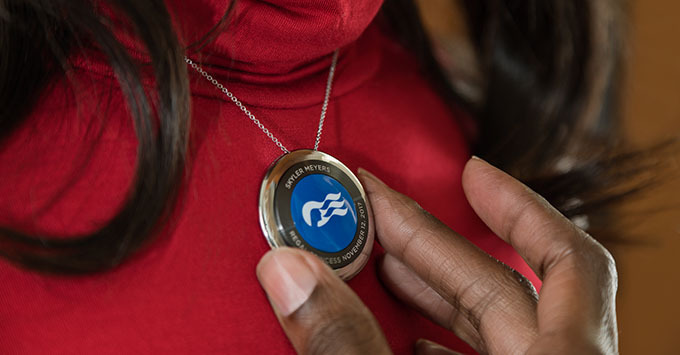 The Carnival Corporation today unveiled the Ocean Medallion™, a first-of-its-kind wearable device that enables a personal concierge by bridging the physical and digital worlds to deliver a new level of personalized service not previously considered possible -- including sophisticated wayfinding, food and beverage on demand, an array of interactive gaming, personalized entertainment experiences and more. The quarter-sized, 1.8-ounce disc can be accessorized with jewelry, clips, key chains and bands or simply carried in a pocket or pocketbook. Powered by proprietary technology developed by Carnival Corporation that features an Internet of Things (IoT) network of intelligent sensors and experiential computing devices, the Ocean Medallion revolutionizes guest service not only for the cruise industry, but the broader vacation industry. It will be officially introduced by CEO Arnold Donald on January 5 when he becomes the first travel industry executive to deliver the opening keynote address at CES, the world's largest annual consumer technology trade show. The Ocean Medallion goes well beyond the growing number of wearables used by theme parks and other vacation companies by leaving behind the required action of "tap" and ushering in a new paradigm for guest interactions. "With this interactive technology platform, we are poised to have our global cruise line brands at the vanguard of forever changing the guest experience paradigm – not just in the cruise industry but in the larger vacation market and potentially other industries," said Carnival Corporation's Donald. "Our focus is on exceeding guest expectations every single day and consistently delivering great experiences, and we do that extremely well. Now we are in prime position to take the guest experience to a level never before considered possible and build on cruising's popularity and value as the fastest growing segment of the vacation sector." Both innovations combine with an invisible network of proprietary sensors and computing devices embedded throughout the ship, home ports and destinations that collectively form the "Experience Innovation Operating System" – xiOS™. The new guest experience platform will debut on Princess Cruises' Regal Princess in November 2017, followed by Royal Princess and Caribbean Princess in 2018. The new Medallion Class on Princess Cruises will be rolled out over multiple years on the entire Princess Cruises fleet. "Ocean Medallion" – a revolutionary, "wearable" device that enables a highly personalized vacation experience The Ocean Medallion is a quarter-sized, 1.8-ounce disc that facilitates the enhanced guest experience. It has no discernible technology – no on-off switch, no charging, no menu to navigate – and can be worn as a pendant on a wristband in a clip or simply placed in a pocket to reveal enhanced services and personalized experiences without guests having to push a button or take any action. The device, laser-etched with the guest's name, ship and date of sailing, is provided to all passengers at no cost. Inside each guest's Ocean Medallion are multiple communication technologies including – Near Field Communication (NFC) and Bluetooth Low Energy (BLE). "Ocean Compass" – a digital concierge that creates the ultimate vacation experience Ocean Medallion works in conjunction with Ocean Compass, a digital experience portal that serves as a vacation concierge before, during and after vacation. The Ocean Compass requires no education or instruction thanks to its intuitive, innovative interface. Ocean Compass is available online, on smart devices, on kiosks in port terminals, on stateroom TVs, on interactive surfaces located throughout the cruise ship and on devices carried by crew members. Guests can use Ocean Compass to enhance their vacations, select experiences and create personalized event-based itineraries. No guest is required to have a personal device to access Ocean Compass. The Ocean Compass also serves as a digital media platform that features custom experiential media content as well as access to vacation photos captured during a cruise. xiOS - Experience Innovation Operating System – "IOT" intelligent sensor network – powers experience personalization from behind the scenes The xiOS is an invisible network of interactive intelligent sensors and embedded devices mounted throughout the ship, home ports and destinations that uses a guest-centric, Internet of Things approach to enable a seamless guest experience. The xiOS unifies hardware and software to create an "Experience Platform." The platform is deployable on any ship regardless of ship age or size. Technology-enabled innovations create a new level of personalized guest service interactions. "The Ocean Medallion creates an elevated level of service that's made possible by technology but doesn't feel like technology," said John Padgett, chief experience and innovation officer for Carnival Corporation. "Whether guests are exploring new experience options, having a drink delivered to their seat at the night's show or trying their luck gaming while lounging poolside, we will assist our guests wherever they are, while engaging with them in a uniquely personal way. Our mission is to help our guests make the most of every moment of their vacation." Ocean Ready™: Streamlined and expedited port embarkation and disembarkation processes. For instance, at the terminal, Ocean Medallion-carrying guests can board the ship, engage with crew members and begin their vacation at their leisure as they already have the "key" to their stateroom (no check-in required). Carnival Corporation will demonstrate its Experience Innovation Operating System at the company's invitation-only Experience Center at CES Tech East, LVCC, South Hall 3, including in-depth and interactive displays of the new technology. Information supplied by: Carnival Corperation. Australian Cruising Newscom.au The HOME Of Australian Cruising!